Linde Werdelin 3-Timer review: No 13 arrived! Since I got back from my honeymoon on the 13th of November, I am proudly wearing my Linde Werdelin 3-Timer with brown dial, no.13/22 (my birthday is on the 13th of April). Ofcourse, I already wrote an article on the prototype that Linde Werdelin sent me, but I thought it would be nice to do a small write-up on the final version as well. The picture above shows three of my watches, all – in my opinion – similar in design and wear. 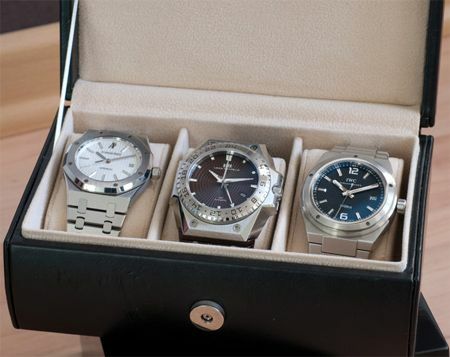 My review doesn’t compare these three watches, since they each have their own pros and cons (and prices), but I included the photograph to show that a relative new brand can create such a great design that approaches the classic ‘Genta’ lines of the AP RO and IWC Ingenieur, without being a copy cat of these models.